»»» Here is now my first release of "Young Beefalo". It can be and will be your strongest companion in your journey if you protect him, feed him with berries, or plant things or wood, grass, care him! it's a very young beefalo baby when he get's in trouble he fight for his life and will focus anyone which hits him or his owner. Of course he have some favorite enemy's like Spiders or Tentacles etc. WIP: "Standalone" Version of the Young Beefalo without the required: "Youngbeefalo Homesign" & "Younghorn". 2. Build a "Youngbeefalo Homesign" and place it somewhere on the ground. 3. Now wait some seconds and the "Youngbeefalo" will spawn near to you. » Accept Owner Targets: Fight in a Team together! » Growing Stages: Gets Bigger, Stronger and Older in 4 Stages. » Tree Chop Feature: (next update 1.05). » Standalone Version: (next update 1.05). » Health & Hunger Bar/Meter Display: (soon). Compatible: "DON'T STARVE BASE"/"REIGN OF GIANTS"
Bugs: PLEASE LEAVE A MESSAGE BELOW IN COMMENTS SECTION! The MOD is still in development, so do not take it too seriously! Thanks to everyone for using my stuff! » Run: Don't Starve & Enable "YoungBeefalo 1.02 -untested-.zip" under "Mods" menu. NO ONE HAS THE PERMISSION TO SHARING/UPLOAD ANY PARTS OF MY MODS. THEY ARE ONLY FOR PEOPLE ON KLEI ENTERTAINMENT FORUMS. ANY VIOLATION WILL BE REPORTED IMMEDIATELY! "06.13.2014" » update - 1.02 - "API UPDATE ONLY"
"05.20.2014" » update - 1.01 - "REIGN OF GIANTS UPDATE"
"02.02.2014" » release - 1.00 - "ALL'S WELL THAT MAXWELL UPDATE"
find the "younghorn" if you have, then build the "youngbeefalo homesign" after some seconds the beefalo should spawn near to you. i'll make some videos. - Is the Controller for "Young Beefalo". - Location: Spiderqueen, Spiderhole, Graves, Deerclops, Monkeys and Monkeybarrels. I only find the beefalo horn,is it? Teen stage: This stage is 5 days. Now it will finally fight and it required less food and will eat grass if found. (keep away from grass farm!) it does nto have any natural enemies and will only attack if commanded. it is as strong as a normal beefalo. 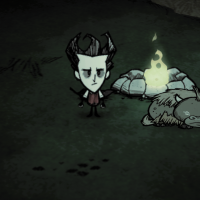 it will now poop like normal beefalo. on death it will drop 3 morsels 3 meat. Adult stage:This stage will last 3 days and then it will leave you. It is stronger than a normal beefalo with more health. its is still a nuetral mob and will only attack if commanded to. It will poop very often and does not need any feeding. On death it will drop 8 meat. and a 20% chance of another baby beefalo horn. it will eat grass on the the ground naturaly. I think the food should just be cut grass because if you watch other beefalo carefully the grass on the grass. thank you. you reached stage 2? it takes really long without cheat to reach all stages. why? simple answer: unfinished / work in progress. i will change things for sure so i'll take your suggestion. thanks but none wants or needs attacks on a person ok? if you don't like so don't use it. easy and i can say it again THE WHOLE MOD is in work so calm down. you should think about: i'm not strong in english language maybe? it would be better if you telling me some stuff you wish for the mod. Excelent mod, I will try it, and will tell you my experience. Thanx! In homesign youngbeefalo only appears the option "Drop"
more info please, what you did. you need the younghorn too not beefalo horn! Well, i have my young beefalo. Not sure what he's good for at this point in his adventure, but there he is. No game crashes as of yet and, until I read the other comment, I wasn't sure how to get (or how I got) the young beefalo horn. I know on another playthrough I got it off the deerclops, but otherwise I wasn't sure. One question though: does he just take time to grow, or can you just feed him enough of whatever he eats to make him grow faster? thanks through time which is extremely long. but i'll take your idea for later. thanks. i'll take your idea for later btw. the whole mod is in WIP: nothing is finished. if i see there is much response. i will and can spend more time in work on the mod. I really want to play this mod, but I can't find it. should I restart the world? I can't download it, I wonder why? sry, i have to wait.